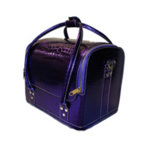 This stunning metallic purple beauty case not only looks great but is practical too! Designed to hold a variety of styling and beauty equipment with retractable and removable trays, allowing for larger items to be stored. Supplied with a matching detachable carry strap. Dimensions: Approx, Width 30cm, Height 30cm, Depth 23cm. Great Stool with storage for mobile hairdressers and beauticians, stool with anti hair wheels which allows you to silently move around your client while cutting, storage for all your tools in the suitcase and also has a service table for use while colouring. Available in Gold, Titanium and Rose Gold or Black. Please leave 7 to 10 working days for delivery. RollerCoaster Stool Case Top Storage Bag, black tool bag for use with RollerCoaster Stool Mobile Case, slips over telescopic handle creating more storage for tools. Comes handle and shoulder strap and zip up storage. Please leave 7-10 working days for delivery. A pull trolley case with combination lock for the hairdresser who wants to protect their equipment while presenting a professional image. 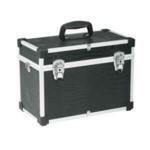 Black Canvas Tool case with white stiching with pull out handle and on wheels. Dimensions: Height 37.5cm, Width 44cm, Depth 24cm. Also now in blue or wine(please use the drop box to order your colour). 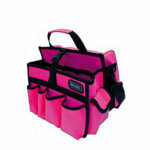 Multi organiser beauty case with a high gloss pink bubble effect finish which is easy to wipe clean. The case features a large interior with 2 extendable trays and 3 pockets suitable for a wide variety of styling or beauty products. With a carry handle and shoulder strap included. Dimensions width 31cm, depth 23cm, height 26cm, trays expand to 68cm. The basketfull travel bag is a multi-compartment storage case ideal for students or mobile hairdressers on the move or just to keep all your equipment neat and tidy in the salon. The front zip compartment holds up to 6 pairs of scissors and there is plenty of storage space and side pockets for all hairdressing equipment. With a carry handle and shoulder strap for easy transport. Approx Size: Width 28cm, Height 32cm, Depth 25cm. The Marilyn is an ultra light leather effect beauty case, 20% lighter than a traditional aluminium case, with a chic, vintage design. It features decorative magnetic straps for rapid opening and closing, elastic straps inside for organising your brushes, combs, clips etc. Closure with lock and key for security and hand stitched corners for a high quality finish. Dimensions: Width 36cm, Height 29cm, Depth 23cm. The Grace is an ultra light leather effect beauty case, 20% lighter than a traditional aluminium case, with a chic, vintage design. It features decorative magnetic straps for rapid opening and closing, elastic straps inside for organising your brushes, combs, clips etc. Closure with lock and key for security and hand stitched corners for a high quality finish. 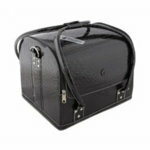 The Sophia is an ultra light leather effect beauty case, 20% lighter than a traditional aluminium case, with a chic, vintage design. It features decorative magnetic straps for rapid opening and closing, elastic straps inside for organising your brushes, combs, clips etc. Closure with lock and key for security and hand stitched corners for a high quality finish. Economical compact aluminium case. 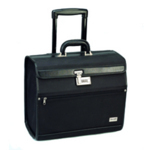 Lightweight and practical hard wearing case with removable internal dividers, carry handle and and shoulder strap. Suitable for all hairdressing and beauty equipment with lock and key for extra security. Ideal for mobile hairdressers, beauticians or students. Available in Aluminum/Black and Black/Aluminum. Dimensions: Width 38cm, Height 27cm, Depth 20cm. Economical compact aluminium case with a stylish black croc design. Lightweight and practical hard wearing case with removable internal dividers, carry handle and and shoulder strap. Suitable for all hairdressing and beauty equipment with lock and key for extra security. Ideal for mobile hairdressers or students. 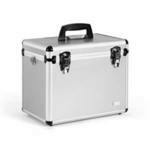 Extra large hard aluminium vanity case with a removable tray to keep all your essential tools close to hand. The Interior is made with anti-static polyester which is hand stitched in each corner. 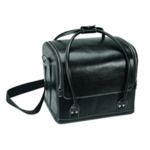 Carry handle and shoulder strap included and closure with a lock and key for added security. Dimensions: Width 42cm, Height 32cm, Depth 25cm. 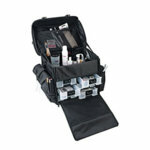 Direct Salon Supplies Beauty artist carry case. 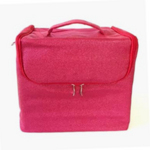 Great for the busy mobile beauty therapists or mobile hairdresser, with fold out trays and carry strap or shoulder strap. Sizes: Length 300mm, Width 235mm, Height 260mm. WAS £45.99 + Vat NOW ONLY £39.99 + Vat!! 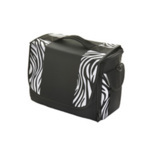 Direct Salon Supplies Leopard Effect Beauty Case, A Stylish Aluminum Leopard Effect Lockable Case with shoulder strap. Sizes Width 36cm, Depth 23cm, Height 29cm. 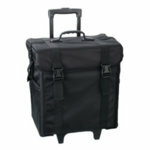 Direct Salon Supplies Windows Trolley Case. 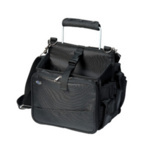 Smart windows opening front trolley case with compartments in attractive black croc effect. Comes with carry strap as well. Size width 43cm, depth 27cm, height 34cm. 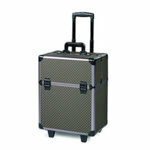 Direct Salon Supplies Windows Silver Trolley Case, smart windows opening front trolley case with compartments. Comes with carry strap as well. The smart handle moves with the cover when the trolley is opened. Direct Salon Supplies Modular Aluminium Case with 3 storage levels and 5 combinations in black croc effect(click on image to see more images). Dimensions width 43cm, depth 22cm and overall height 65cm. 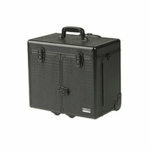 A Stylish Case with Combination Lock for the hairdresser who wants to protect their equipment while presenting a professional image. Black Canvas Tool case on wheels and pull out handle, also with a removable brush, comb and scissor tool holder. Dimensions: Height 36.5cm, Width 42cm, Depth 22cm. 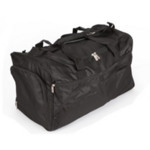 Crewe Orlando Medium Black Kit bag with large internal zipped storage. Velcro fastened pouch at back, zipped pouch at front and zipped compartment at front. Carry pouch on each side with shoulder strap. 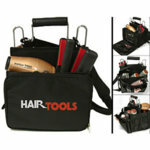 Bag contains scissor and comb/brush holders and internal dividers. 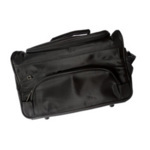 Crewe Orlando Large Black Kit bag with scissor holder and detachable shoulder strap. 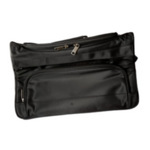 Internal and external pouches and two front zipped compartments. 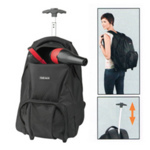 This comfortable Backpack has an integrated telescopic handle and wheels, to turn a rucksack into a trolley with ease. 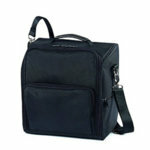 Made from heavy duty nylon with a front storage compartment, ideal for all small accessories. 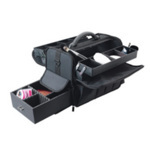 Designed to hold a variety of styling equipment with its vast amount of pouches and compartments, Supplied with a detachable strap for carrying on your shoulder. 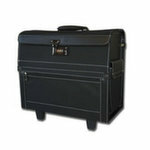 Black polyester beauty case with shoulder carryi9ng strap. Convenient folding and adjustable trays at the top. A larger storage compartment can be folded open at the side and extra storage space on the outside. Lightweight and easy to carry. Ideal for any mobile therapist, make up artist or student. 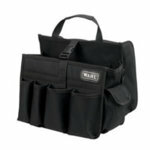 Direct Salon Supplies Nail Artist Bag, a practical case for all your equipment, it has a large storage compartment at the top and also small storage drawers and a handy pockets on the side. Dimensions width 34cm, height 33.5cm and depth 26.5cm. Now with all black trays. 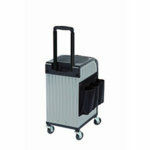 Nail Artist Trolley to transport all your beauty materials safely. With a large compartment at the top suitable for the UV Nail Lamp, Electrical Nail File or any other larger items. Eight sliding drawers at the bottom for all your smaller materials and extra side bags ideal for storing bottles. Dimensions: Height 41.5cm, Width 40cm, Depth 29cm. Direct Salon Supplies Nail Artist Kit, our great nail artist trolley and nail artist bag together in one. The nail artist bag slides over the trolley handle via the extra strap at the back, thus giving you extra storage space and lots of drawers and only one trolley to pull. Dimensions approx width 40cm, height 75cm, depth 29cm. Please note all trays are now black. 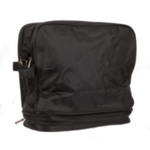 Direct Salon Supplies Black Student Holdall. With carry handles and long shoulder strap. 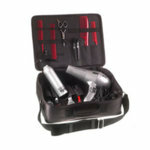 Ideal for all your larger hairdressing or beauty equipment. Approx Sizes: Height 30cm, Width 50cm, Depth 30cm. 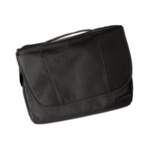 Direct Salon Supplies Large Black Pouch Bag with scissor holder and accessory storage compartment at the bottom. 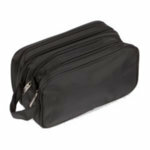 Direct Salon Supplies Small Black Pouch Bag. 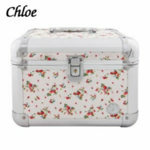 with two open storage compartments and a scissor and accessory holder compartment. The Riva Bell is a stylish 3-piece lockable aluminium trolley case in a striking ribbed pink, pink croc, purple croc, sorry silver and black both out of stock(Please Use The Drop Down Box To Choose). Designed and made to last with study wheels and strong hinges yet light weight with a detachable handle, this trolley is ideal for the mobile beauty professional. Each section can be used alone or with one another and are soft lined to protect the products. Dividers allow it to be customised to suit individual needs. Deep enough to hold tall bottles, hair-dryers, towels etc with pull-out sections to keep small cosmetic items and accessories safe and tidy. The San Remo is a large sized versatile beauty box available in a selection of colours and designs. Lightweight but strong construction. Stylish British design with sturdy chrome hinges and handle. Lockable top opens to reveal two hinged soft lined trays suitable for small bottles, brushes etc. Deeper lined tray below holds larger items securely. Please use the drop down menu to Choose the colour. 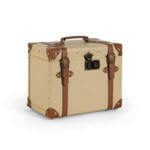 The Valene is a smaller sized attractive beauty case. Available in pink, lilac, lemon, green and silver ribbed aluminium finish. 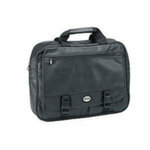 A Stylish British design that is lightweight but tough with strong chrome hinges and black handle. 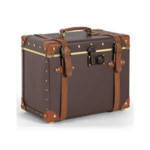 Lockable catch on top opens to reveal two soft lined hinged compartments with a deep drawer below. Suitable for a variety of uses and products including bottles, jars, brushes etc. A truly great beauty box, ideal as a cosmetics case, Available in a Great Range Of Colours Pink, Lemon or Leopard(Please Use The Drop Down Box to Choose Your Colour). Please Click On Image For More Images Of The Valene Beauty Case. Size: Width 25cm, Depth 18.50cm, Height 23cm. 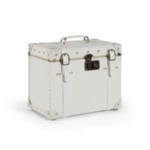 St. Tropez is a medium sized stylish beauty box. Choose from black or silver ribbed aluminium finish. 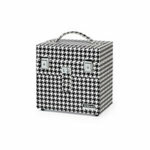 Lightweight but solid construction with strong chrome hinges and black handle. Opens from the top to reveal two soft lined pull-out sections with deep drawer below. A British design with quality and style suitable for many uses. Head Jog Student Zip Up Case. (Click on picture to see inside of the case). 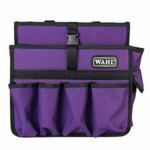 Wahl Large Student Carry Holdall. Multi Compartment Storage. Please Note: Tools Not Included. The Paris Case is a British designed black croc beauty bag perfect for professionals who need to separate their kit into different compartments. The case is made up of four different trays that extend out, suitable for hair and beauty accessories, and one deeper compartment below ideal for larger items such as bottles, pots, and tubes. The trays are also removable to make it even easier to access all of your equipment. 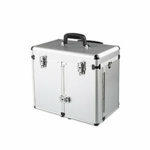 Direct Salon Supplies Zarrin Case, a deep and spacious beauty case which features a mirror on the inside lid. With aluminium fittings, a strong handle, and a locking mechanism, this case ensures your products remain safe and secure. 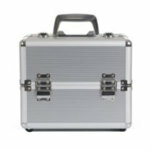 Direct Salon Supplies Beauty Tool Box, beauty trolley with combination number lock, 8 foldout trays with dividers, large base storage, telescopic pull handle, carry handle all finished in steel grey and squared design. Dimensions height 50cm, depth 25cm, width 35cm. Beautiful and compact vanity nail case designed for nail technicians, consisting of two parts. The upper part easily stores all your small nail supplies in little square compartments, small mirror on the lid and the lower part is extendable and is completed with elastic bands for holding things. Dimensions height 22.5cm, depth 16cm, width 23cm. Available in all white, black and white and all orange.